Perce and its magnificent rock are one of the best known scenic attractions in North America. The area never fails to impress visitors and to live up to its reputation. Located appropriately in an area known as Land’s End, on the eastern-most shore of the Province of Quebec, the rock stands defiant against the sea. Today the area that comprises the Rock and Bonaventure Island are a Canadian national park - parc de I’Ile Bonaventure-et-du-Rocher-Perce. 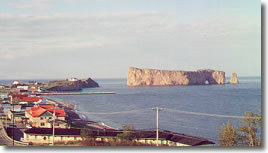 Perce Rock was written up as early as the 1500's by Jacque Cartier who called it the pierced rock and mentioned two holes. Very early sketches indeed show two rocks. During the 1840's one of the holes collapsed. The obelisk left standing collapsed in 1950 with such force it was heard in the village which was also covered in the resultant dust. Each year 300 tons of rock is lost to erosion from the formation. There are two special times when the Rock should be photographed, early in the morning and when the sun is lower in the evening sky. Colours of the rock and surrounding areas are gorgeous that these times. Don’t miss climbing to the cross on the hill overlooking the Rock for great views back over the village, coastal hills and headlands. The red roofed house so prominent on Cap Canon when one looks toward the Rock, belonged to Frederick James, an American painter. The house, with its huge north facing window, is due to be restored and refurbished then opened to the general public. In the meantime it makes for great picture taking. If you time your visit properly you can walk to Rocher-Perce, at low tide. Otherwise, a boat ride is the best way to fully appreciate the beauty and majesty of the rock formation. Les Bateliers de Perce Inc is one of the area’s best tour operators. Opt for a tour of both the rock and Bonaventure Island, a bird sanctuary. Have your camera ready when the boat goes to the sea side of the rock for the view of the lighthouse through the hole, as you look back toward the village. The Island is a national park and home to more than 250,000 birds, 76,000 are gannets in one of the largest and most accessible colonies in the world. To see the gannets requires a long walk so you should plan to spend at least half a day on the island. Time your visit for early morning and take a picnic lunch that can be purchased at La Boite de Lunch - the Lunch Box, on rue de Quai right at the dock. Your best time of year for visiting is June or September. July and August are zoo-time in Perce. There are several options you have for the boat ride to the island. You can go directly to the island’s dock or you can circle Bonaventure before landing. Opt for circling the island so that you can see the colonies of gannets and murres from the water. The view is impressive! While heading for Bonaventure watch for seal and whale. The ride isn’t usually rough. 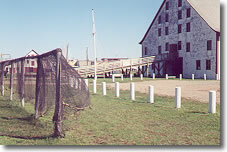 On the Island, there are a number of trails you can take to view the colonies. There are also rules that must be followed, including that of leaving no garbage behind. Wear comfortable shoes and pack a bottle of water, or two. The fastest trail is the Sentier des colonies which is forty five minutes one way but isn’t a strenuous walk. Just give yourself lots of time. The gannet colony is an incredible sight. Observation decks are such that you can get up close and personal with the birds. As the colonies are shown in their natural state, there’s a lot happening around you. This is not a sterilized version of a bird colony. It is an amazing scene. You’ll learn all sorts of facts from national park’s staff. Did you know that gannets have a wing span of six feet? 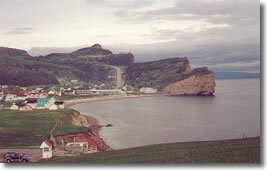 The landscape changes when you leave Perce, heading for the Bay of Chaleurs. The land seems to flatten out. Headlands are less rocky and not so prominent. Seascapes are almost pastoral compared to those in the Upper Gaspe. There are lots of things to see and do along the shore in Land’s End and the Bay of Chaleurs area. Cod fishing was most important for this area of Quebec. The Banc-de-Paspebiac on the banks of the bay in Paspebiac, is dedicated to preserving maritime heritage and the cod fishing industry. Displays and hands-on demonstrations bring the history of cod fishing and its effects on Gaspe villages very much to life. A hint, if the blacksmith gives you a hand forged nail, make a wish immediately! On-site L’Ancre restaurant is one of the best for sea food. To learn all about the flora, fauna and landscape of the Gaspe, drop into Bioparc de la Gaspesie, in Bonaventure. The park is divided into five different ecological systems with appropriate plantings, animals and birds. Riotel Chateau Blanc, right on the bay in Bonaventure makes a good overnight stop as there are lots of attractions nearby. 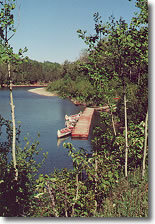 An alternative accommodation can be found at Cime Adventure, about five miles from the town of Bonaventure. Cime Adventure holds a lot of surprises! Book ahead to spend an evening in one of their unique tree top eco-lodge, accessed by above ground walkways so that the forest floor is not disturbed. Drop into their office area for a peek at the staircase made from the roots and trunks of trees. Camp for a night in one of their spacious teepees. Rent a canoe and paddle down one of the most pristine rivers in Quebec. Order gourmet smoked salmon pizza at their outdoor restaurant and enjoy it while watching canoes float lazily down the river. 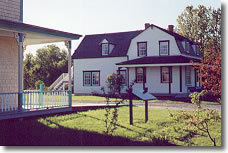 The Quebec Acadian Museum - Musee Acadien du Quebec a Bonaventure - is located on #132, across from the Chateau Blanc. A combination of art gallery and museum, the facility gives an account of the Acadians and their life before and after expulsion in the 1700's. One of the most interesting on-site features is a display of miniature buildings, executed by Marcel Arsenault that were important to the Bonaventure area 1940 through 1960. For a glimpse of heritage as it pertains to peoples from the British Isles in the Gaspe, drop into the Centre d’Heritage Britannique de la Gasperie - the Gasperian British Heritage Centre. 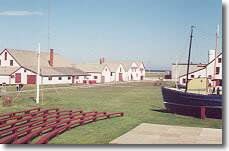 Beginning in the 1980's a number of historic buildings were moved to the site to create a village and farm community whose roots lie deep in British Isles tradition. The recreated village holds a number of special events, the most popular, Traditional Days Bluegrass Festival, held at the end of August each year. The site does have a gift shop and restaurant that operates during high summer season. Hostellerie Baie Bleue, in Carleton provides great accommodation and excellent meals after a day of exploration. Warm water beaches are great for relaxing and there are excellent hiking trails close-by. Located right on the bay, the facility is close to one final must-see Bay of Chaleurs attraction that presents the history of the earth etched in stone. As the attraction is a little way off Highway #132, follow signs for Le Parc de Miguasha - Miguasha Park, a World UNESCO Heritage Site and home to large numbers of fossils from the Devonian period known as the age of fishes. For those not in the know, the Devonian period transpired some three hundred and seventy million years ago. 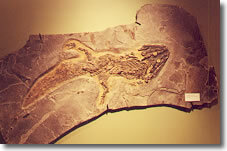 The ancient estuary of the Ristigouche River that makes up Miguasha beds has provided a large concentration of fish, invertebrates, plants and spore fossil species. You should take in the video presentation, excellent fossil displays and laboratory demonstrations before touring the fossil rich cliffs. To understand fully what you are going to see and to watch professionals in action, a guided tour is recommended and should be booked at least 24 hours in advance during the busier months. 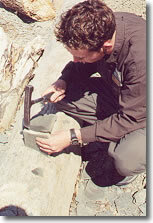 As the site is protected, you cannot remove fossils, excavate the cliffs or collect specimens from the beach. Any you find have to be handed in at the Interpretation Centre. There’s a nice café and gift shop at Miguasha and lots of interesting books on fossils and geology. You have a choice as you set out on the last leg of your drive along Highway #132 through Pointe-a-la Croix toward Matapedia. If leaving the Province of Quebec for New Brunswick, you can cross the bridge over the Bay of Chaleurs at Pointe-a-la-Croix to access Campbellton. Or, you can complete the Highway #132 loop by driving to Matapedia where the road turns north and runs through an area known as The Valley. The route passes through Causapscal, Amqui and Sayabec before ending at Saint Flavie on the south shore of the Fleuve de Saint-Laurent - the Saint Lawrence River. Bon Voyage!